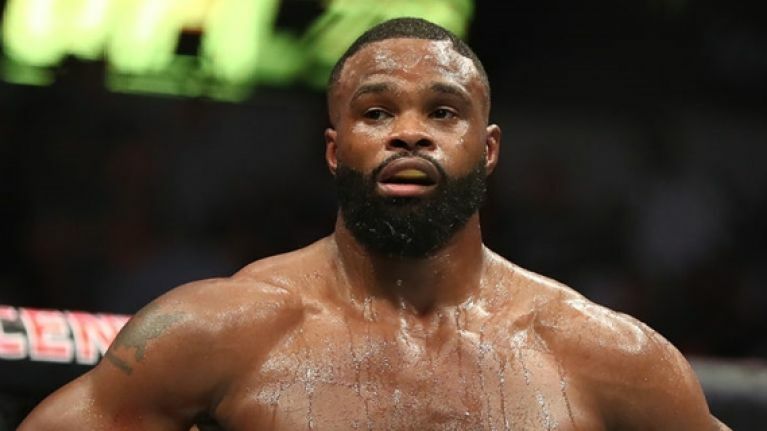 The way Tyron Woodley reacted to his submission victory over Darren Till was very noteworthy. 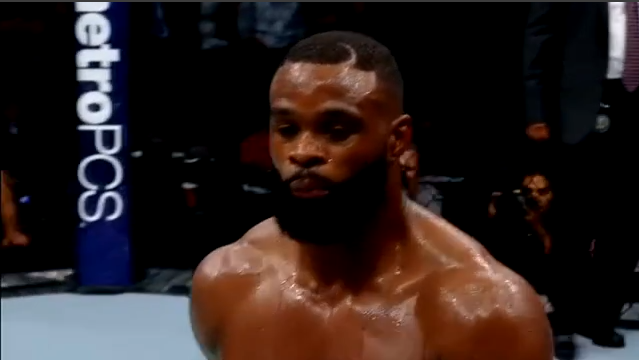 Tyron Woodley had a flawless performance at UFC 228. He beat up Darren Till on the feet, finished him with a submission and didn't eat a single significant strike in the entire fight. That's a remarkable achievement for the UFC welterweight champion, especially considering he entered into the bout as the betting underdog. However, he didn't celebrate the win like the stunning achievement it was. After releasing the submission, 'The Chosen One' slowly stood up. With an expressionless look on his face, he turned to Till and embraced him. Then he put his hands on his hips, strolled across the Octagon and gave his coach a fist bump. It was only when Din Thomas awarded him his black belt in Brazilian jiu-Jitsu inside the cage that Woodley showed some emotion. He wrapped the belt around his face and wiped the tears of joy away. However, until that moment, he looked like he was waiting in line at the post office. Woodley hasn't exactly been a popular UFC champion. In fact, at certain points, he may very well have been the most hated titleholder in the promotion. Lacklustre title fights against Stephen Thompson and Demian Maia, requests for Money Fights, complaints about how he was being promoted and of course, Dana White's constant criticisms all contributed to this negative image held by a lot of fans. As Thomas told ESPN, this played a factor in his subdued reaction to finishing Till. After being booed in previous title fights, he doesn't want to respond with negatively. So, for now, he has conditioned himself to remain focused on the task at hand - winning and staying at the top of the division. "This is something we've been talking about working on for a couple years. Since he became champion, he thought it was going to be different. At the end of the day, he really thought it was going to be different. You become champion, best in the world, and you think you're going to get this adulation from the community and the world - and for him, it seemed to get worse. It really frustrated him. He thought everybody was going to appreciate him, and it was like, people hated him."  "He's realised that being frustrated and sending that type of energy back wasn't helping. So we've said, 'Let's just focus on what we're here for and that's winning.' We can't afford to lose, because we know what people are saying now. Imagine if we lost. So let's not waste energy on complaining and just get the job done." Public perception of Woodley appears to be changing after his last fight. If he fights notorious troll Colby Covington next, he is guaranteed to be the crowd favourite.